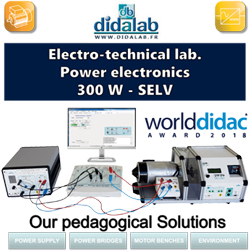 Booklet showing our products for electrical machines and power electronics in the SELV 300-W power range. It works, in accordance with the standard SELV « Safety Extra-Low Voltage, 48 VDC and 24 VAC », at voltage rates avoiding to use complex and expensive electrotechnic tables. 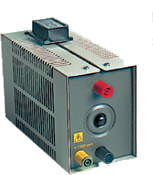 SELV power supply specially designed to carry out practical works on any power electronics bridge (1-/3-phase rectifiers, choppers, 1-/3-phase inverter). 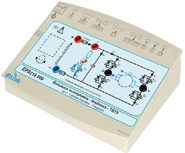 Its output voltage, complying with SELV standard, avoid expensive measuring and/or protection systems. It is plugged on mains (1-ph 220 V /50 Hz). By electronic assembly +/-10 VDC (in static chopper or single-phase inverter). ▪ All types of thyristors. The EPS130 is conceived to operate in SELV configuration (Safety Extra-Low Voltage), whose main asset is to be usable without any resort to expensive electrotechnical installations. → Specially adapted for practical works as well as during a lecture to spot a particular phenomenon via a PC + video-projector. ▪ D_CCA: speed servo-control (depending on the operative part). ▪ D_Scil: simulation, rapid prototyping, creation of new correctors. ▪ Double nested series (+E/0/–E). ▪ Variable frequency: PWM +E/-E, +E/0/-E. The EPS210 is conceived to operate in SELV configuration (Safety Extra-Low Voltage), whose main asset is to be usable without any resort to expensive electrotechnical installations. The EPS230 is conceived to operate in SELV configuration (Safety Extra-Low Voltage), whose main asset is to be usable without any resort to expensive electrotechnical installations. Chopper training monitor, 2 quadrants, 30 V 5Amp. Overvoltage / Subvoltage chopper, enabling the study of the driving & braking principles by energy transfer. DC motor load unit: 120 W, parted excitation load generator: 120 W.
Loading rheostat → 9.3 Amps ; adapted to experiments in Power electronics.